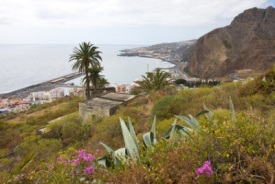 Located on the eastern part of La Palma, Santa Cruz is the capital and largest city of the island. Spanish for “Holy Cross,” the city has a population of nearly 20,000 residents and acts as the major port for the island. For visitors looking to explore outside of the city, Breña Baja offers a panoramic view of La Gomera, the second-smallest of the Canary Islands.